CEO/Owner, The Primavera CompanyTwo thousand years ago, a famous Chinese general wrote a book on strategy call the Art of War. To this day it is considered to be one of the greatest books ever written on strategy. And this is what Sun Tzu said “Weak leadership will destroy the finest strategy – while forceful execution of even a poor strategy can often bring victory.” So you have the guru of strategy saying – it is execution that trumps! I agree. I am all about strategic planning but I am also about strategic doing. How do we get ourselves and our organization to do the things that matter most – week in and week out in our business. This is a huge challenge we all face as leaders. Here is what happens. You show up for work on a Monday morning all intent on working on some very important project. By 9 am you are “up to your ears” in alligators. And you work on those alligators all day long. This can go on for days, weeks or months and one day you look back on that important project and realize you never made much progress on it. Make or Break™ Execution is about making sure you and your people are doing those things that matter most – and not spending so much time dealing with alligators. The best leaders I have worked with have both a clear vision and also an eye for the operating detail that will “Make or Break” their vision. A company with no vision will spin its wheels. And yet even the best vision will go nowhere in the face of poor execution. The big struggle for most leaders is how to do both. How do you actively lead your organization to insure superb execution without being consumed by the details and the urgent “alligators” you face daily? Some leaders can do both. It is what I call, “No vision too distant – No detail too small”. It is powerful combination in a leader. Make or Break Execution helps you bring that combination to your organization. Vision is important. One of the most fundamental things we do as leaders is to “describe the future.” People look to leaders to learn where the business is going. What are we trying to accomplish? How are we making the world a better place? Some leaders are really good at doing this. They can describe the future in a way that is clear and compelling. Their people say “that is cool”. I’d like to be a part of that. I think a lot of leaders are pretty good at vision. What you rarely see in the same person is someone who can also say “this is what we have to do to get there”. When you see that combination in a leader – clarity of where you are going and also clarity on what needs to get done to get there – it raises the “energy level” and the “level of play” for several reasons. First, people like to know where they are going. And when you make that clear to them, it raises the energy level. But they also figure that if you know what needs to get done to get there, you are going to make some pretty good decisions – about resources. You will also recognize when a good job is done. And that tends to raise the level of play in an organization. Make or Break Execution is about bringing that combination to your organization: clarity of where you are going (your vision) and also clarity about what needs to get done to get there (your Make or Break). I think all good performance starts with clear direction. I make the argument that every company (and every department of a company) has a Make or Break. 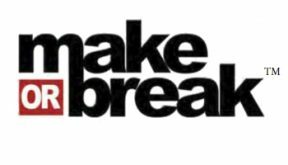 The Make or Break is “the one thing that must be done extraordinarily well throughout your organization for you to achieve your vision”. You have to do many things well in a company but what is the one thing that will most cause you to get to your vision (your Make or Break). If you can figure that out and then make sure that is happening at the pace it needs to every week in your organization, it will drive you toward your vision. A good example of the concept is Apple®. They are arguably the most successful company of the last decade. Steve Jobs made it very clear what mattered most in that company. He said at Apple it was “design”. He personally led “design” himself. There are some interesting stories about his leadership of design. For example he believed that buttons are a clunky design element, that they dehumanized technology. He always tried to eliminate buttons from Apple products. Jobs made sure design infused everything at Apple Look at the design of Apple stores – completely different than any other store. They operate differently – no cash registers. The design of the IPod® changed the personal entertainment industry forever. In fact it transformed the music industry, the video industry and the game industry. An IPod holds thousands of songs and you can find the one song you are looking for in a nanosecond – and it has almost no buttons. The IPhone® was designed to turn cell phones into complete computers. You can do more on an IPhone these days than on most computers – there are over 650,000 apps for IPhones. And some can do amazing things. My Tom-Tom® app gives better “turn by turn” GPS directions than the GPS built into my 2012 car. The IPhone has changed the world we live in (almost everybody on this planet has a cell phone – as cell phones become complete computers which is rapidly happening – it changes the world in amazing ways). The packing at Apple is amazing the way it is designed. People will save their original packing forever. Even the design of the bags they put you purchase in is cool. Ever see kids with Apple backpacks. That was the bag they put their purchase in. What has happened at Apple is that design infuses everything. The reason for this is because Steve Jobs made it very clear that design is what matters most at Apple. So he had thousands of people in every part of that company working hard to do great design. He led it himself. And he literally changed the world by doing this. I encourage you to bring you Make or Break to your organization and make it clear that this is the thing that matters most. You will be amazed by what your team will do. How do you figure out what your Make or Break is? It starts with your vision. Remember your Make or Break is the one thing that will most cause your vision to happen. So start by creating a clear vision. The key question in developing you vision is to ask “what do you want your company (or your department) to look like a few years down the road?” I encourage you to involve your people in coming up with both your vision and your Make or Break. It will be easier to implement them if your people had a role their development. It is your people who create your success. So the more clear and specific you make your vision for them, the better. I encourage you to make your vision measurable. If you can measure it, you can show progress toward it. It is a great way to build energy and confidence with you team. Ask yourself if your vision would make you happy if you achieved it. If the answer is yes you will be committed to it. And your people will know it – it will show through. Also keep your vision short. If it is short, people can remember what it is. I see many paragraph long visions but invariably nobody in those companies knows what the vision is. If your vision is short people will remember what it is. Once your vision is clear you can go to work on your Make or Break. I encourage you to work with your people to develop your Make or Break. First look at your vision and ask the question, “What is the one thing that must be done extraordinarily well to achieve this”. Ask a series of questions to identify whether it is a weakness you must fix or a strength you can leverage. In the case of Steve Jobs and Apple, in 1983 Jobs had been forced out of the company (fired) by his board. They brought in new management. The new CEO was John Sculley who was recognized as a marketing genius. He did a tremendous amount of marketing while he was CEO and it was great marketing. But it was not what Apple needed. After 10 years, Jobs was rehired because Apple was on the verge of bankruptcy. Jobs came back and said to his team that Apple had lost their way. What mattered most was design. And he refocused the team on design. Soon came the new IMac® which turned around their computer business, then the IPod, the IPhone, and the IPad. By focusing on design, Apple became the most successful company of its day. Apple illustrates the power of identifying what matters most and then getting your team to focus on getting that done all the time. Once we know what our Make or Break is, how do we get our team to focus on it. How do we get extraordinary execution? I want to talk about four concepts for getting powerful execution. First is your role as a leader. Bring your Make or Make to your organization with clarity and passion. Roll up your sleeves and be a part of it in your organization. I am not talking about micro-managing your people in this area. I am talking about holding people accountable for getting this done. Let them do it, and be sure they know how important it is. Second, build a Value Chain for your Make or Break. A Value Chain is defined as a series of actions that create value. When you put activities into a Value Chain, they become leading indicators of that result. That is because activities always look forward. Your do an activity today, you get a result tomorrow. Figure out which activities cause your Make or Break to happen. Then you can hold people accountable for doing those activities. This actually gets you “facing forward”. The activities you are doing today will cause your Make or Break to happen in the future. Third, hold weekly meetings to be sure everyone is doing the activities that cause your Make or Break to happen. This combination of identifying a clear vision, figuring out what matters most (your Make or Break) and then making sure the activities are happening every week will bring “No vision too distant and no Detail too small” to your company or department. And you will be in the middle of it all – actively linking together people, strategy, and operating detail – doing the real job of an effective leader. You will have the Core of Success. Barnett is a recognized expert on business and has appeared regularly on CNBC’s “Squawk Box”, Bloomberg and the Wall Street Journal to speak on CEO confidence and leadership. Named “U.S. Speaker of the Year” by TEC Canada, “Overseas Speaker of the Year” by TEC Australia, winner of Vistage International’s “Fast Track” award and recipient of the coveted “500 Club” award, Barnett is an internationally recognized consultant and speaker whose leadership concepts – “Make or Break Execution®: the core of success” and “Make or Break Culture: get extraordinary results from people” has helped thousands of companies throughout the world. Barnett has headed companies for some of the world’s leading corporations including Nestlé, Pillsbury, Weyerhaeuser, and Constellation Brands as well as running smaller private companies. He is currently the CEO and owner of The Primavera Company, a small real estate and natural gas company with operations in three states. Dan has a global consulting and speaking business and is Chair of two Vistage private advisory boards in Reno Nevada.